Standing desks are quickly becoming staples in workplaces all over the world. People are becoming increasingly aware of the dangers of sitting for long periods of time and the sedentary lifestyle that comes with working a desk job. But what if there was a way to take it one step further? That’s where the FluidStance Level board comes in. Instead of standing still all day, the Fluidstanc keeps you moving and healthy. What is a Standing Desk Balance Board? A Level board is essentially a standing desk balance board. The flat wooden top is shaped like a skateboard, but the bottom of the board is shaped just like a regular balance board you find at the gym. 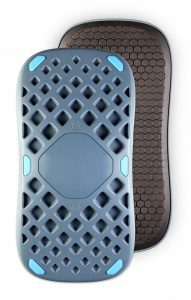 The board allows for 360-degree movement to activate your core and keep you moving throughout the day. The subtle movement is enough to increase your heart rate, but won’t distract you from work. The design of the board keeps you in constant movement throughout the day, so you keep your blood flowing and your muscles firing. A simple adjustment of your weight can move the board forward, backward, left or right, so you never have to get off the board to adjust its position. The board is built to last and withstand the abuse of everyday use. It has a sharp, sleek and modern look, too. The company sells single boards in bamboo, walnut or maple. You also have the option of purchasing a fleet of boards (5 total) in each wood option. The fleet option comes with a rack for easy storage. The fleet option is great for employers who want to prioritize health and wellness in the workplace. 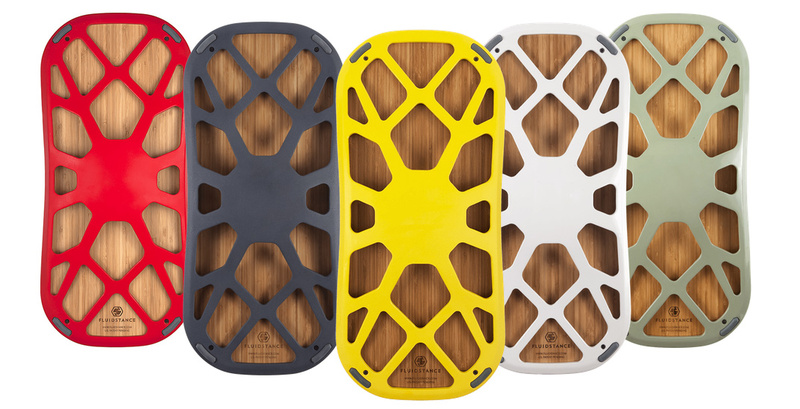 Along with the Level board, FluidStance also offers boards made of recyclable plastic and foam or rubber. Known as Plane boards, these models come at a more budget-friendly price. They aren’t as sharp-looking, but they’re built to do the same thing the Level board does. There are two types of Plane boards: Cloud and Blue Storm. The Cloud board adds extra cushioning with a foam layer that’s 100% recyclable and made from naturally non-microbial materials. The Blue Storm board doesn’t have the extra layer of foam. This is the most basic board from FluidStance, but it’s made form the same materials as the Cloud. FluidStance takes sustainability seriously. Both the Plane and Level boards are made from recycled materials. The Plane boards are produced with 100% post-industrial recycled plastic – HDPE – which is one of the strongest plastics out there. The entire Plane board can be recycled, which prevents it from ending up in a landfill when you’re done using it. The base of the Level board is made in a solar-powered facility in California. The powder-coated finish has near-zero emissions compared to painting and anodizing. Any scrap metal leftover from the manufacturing process is recycled to minimize waste during the casting process. Whether you’re already a standing desk user or just making the switch to one now, you may be wondering why you would need a balance board for your desk. Making the switch from sitting to standing is a great start in improving your health if you work a desk job, but a balance board will take it one step forward. Rather than standing still, the board allows you to stay on the move all day long. It’s comfortable to use, too. 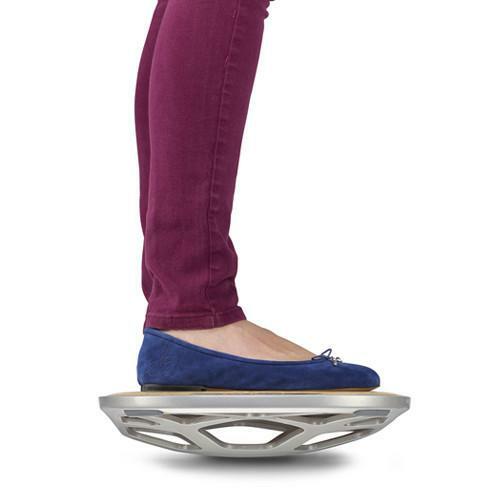 If you’ve ever used a regular balance board, you know how uncomfortable it can be to use for long periods of time. That’s why more people aren’t using regular balance boards at their desk. The range of motion is too great in either direction. The Level and Plane boards limit plantarflexion (when your heels are above your toes) and dorsiflexion (when your toes are above your heels) to levels comparable to walking. You don’t have to worry about dipping too far forward or backward, which could put you at risk of injury. And if you’re worried about being distracted or unable to type properly while standing on the Level board, don’t be. 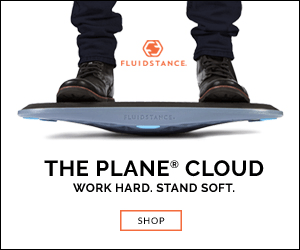 According to data from FluidStance, there is no statistical difference in typing errors between someone standing still and someone standing on a Level or Plane board. How effective is the Level board at keeping you moving? Effective enough to be NEAT Certified. NEAT (Non-Exercise Activity Thermogenesis) was developed by the Mayo Clinic, and to qualify, the product must increase energy expenditure by 10% compared to sitting. What does this mean? 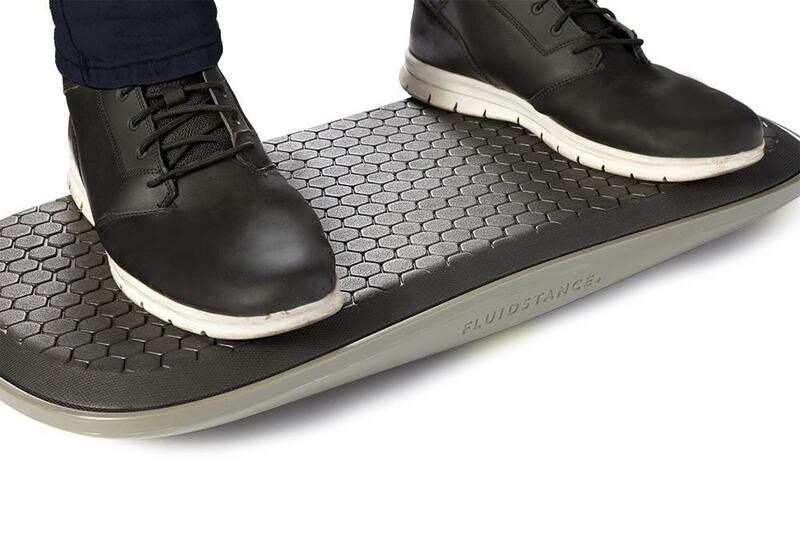 Essentially, the Mayo Clinic has confirmed that using Level and Plane boards from FluidStance allows you to actively burn calories through constant movement throughout the day. Heart rate and energy expenditure were measured for 20 minutes. According to data from the study, energy expenditure increased by 19.2% compared to sitting when using the Level board. What’s great about FluidStance boards is that they don’t have to be confined to the office. They’re compact and light enough to be brought home and used around the house. Maybe you’re folding laundry or doing the dishes. Why not keep your body moving while doing these mundane house chores? 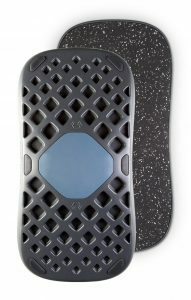 FluidStance is helping pave the way to a healthier workplace with their Level and Plane boards. They make a great addition to any office or work environment where health and wellness is a top priority.